A special garden showcasing the diverse landscapes of the British countryside will feature at the 2018 RHS Hampton Court Palace Flower Show (3rd to 8th July 2018) to celebrate BBC1 Countryfile’s 30th anniversary. The garden, designed by award winning garden designer, Ann-Marie Powell, is inspired by the British landscape and will encourage visitors to reconnect with nature to mark the anniversary of one of Britain’s best loved and most watched TV programmes, which shares the people and stories at the heart of the British countryside. The garden features a tiered landscape representing different areas of the British Isles from the Scottish Highlands, Yorkshire dales and moors to woodlands in North Wales to the coastal areas and streams of the south and Ireland. 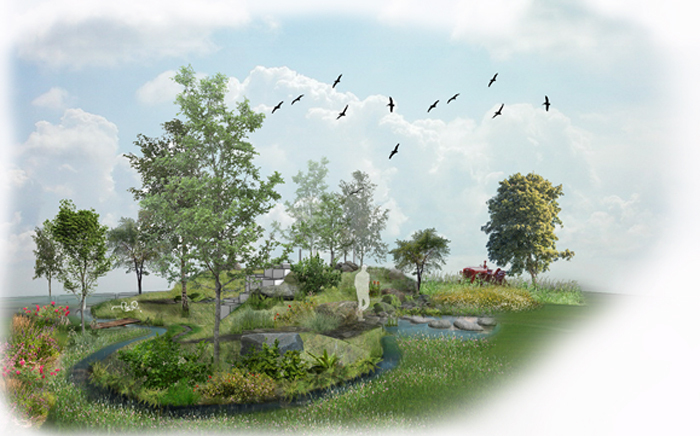 Each area will have its own characteristics with unique stone, plant and wildlife habitat. Ann-Marie Powell says: “It is both an honour and a joy to create this wonderful garden for Countryfile at one of the biggest and most famous gardening events in the world. It’s going to be very different to any garden that has ever been at Hampton before and I’ve loved researching and being inspired by Britain’s amazing landscapes whilst creating my design. The garden will feature some of the country’s best loved plants and trees including Ligusticum scoticum (Scot’s Pine), Helianthemum nummularium and wild thyme and an abundance of Crataegus (hawthorn). Weathered limestone will also feature as will native beech and woodland trees such as Fagus sylvatica.